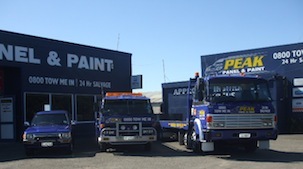 Welcome to Peak Panel & Paint located in the Bay of Plenty 20 mins from Tauranga. Here at Peak Panel & Paint we do all insurance and private work. Cover a large range of vehicles from cars, trucks, boats & motor homes. We provide a full range of services inlcuding panel beating, windscreen repairs, painting, plastic welding, fibre glassing, structural engineering, snadblasting, airbrush work, sign writing and stone-gaurding. © Peak Panel & Paint Limited. All Rights Reserved 2016 - 2018. | Coding and Hosting by Vision Lab.